Erlangen colleagues synthesized a series of N-heterotriangulenes, which can be used for dye-sensitized solar cells and potentially for fluorescent pH sensors. N-heterotriangulene is a flattened relative of the propeller-shaped triphenylamine (TPA). Since organic dyes based on TPA can be used to build dye-sensitized solar cells (DSSC), it is conceivable that its planarization enhances photovoltaic performance. Indeed, working N-heterotriangulene-based DSSCs were already built. 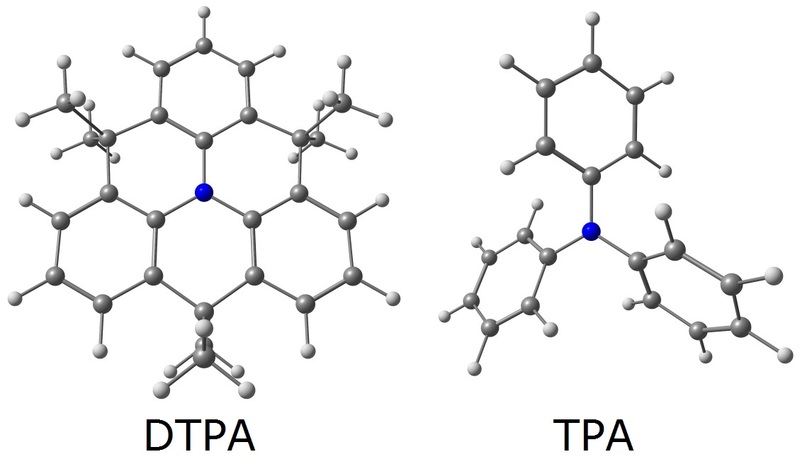 Colleagues from my Alma Mater decorated N-heterotriangulene (dimethylmethylene-bridged triphenylamine, DTPA) with 1, 2, and 3 pyridyl moieties (derivatives are shown below), which serve as anchors for binding N-heterotriangulene to the TiO2 and ZnO surfaces . This binding is known to be quite strong and such anchors enable efficient electron injection. These pyridyl-substituted N-heterotriangulenes are donor–acceptor dyes with N-heterotriangulene core serving as an electron donor and pyridyl groups as acceptors. It is corroborated by DFT calculations, which show that Kohn–Sham HOMOs are localized on N-heterotriangulene core and LUMOs on pyridyl moieties as you can see below for the monosubsituted DTPA. 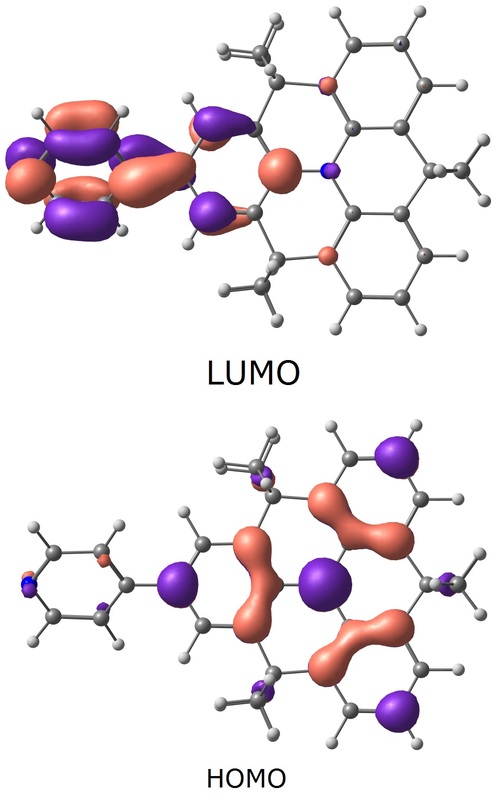 Increasing the number of pyridyl groups lowers LUMO and, to a lesser degree, HOMO energies. This effect is the strongest for the first substitution. As a result, substituting with the first pyridyl group leads to the largest bathochromic shift in the UV/vis absorption spectra relative to the parent N-heterotriangulene. Substituting with the second group still leads to the significant bathochromic shift, but not that large, while substituting with the third group has only very minor effect. Both absorption and emission spectra of the pyridyl-substituted DTPA are strongly bathochromically shifted upon protonation, which can be potentially interesting for building pH sensors. Additionally, all pyridyl-substituted N-heterotriangulenes feature a positive solvatochromism (59–74 nm) when going from nonpolar cyclohexane to polar methanol. Interestingly, TiO2-based DSSC devices using DTPA substituted with two pyridyl groups as sensitizers show improved performance compared to devices using mono- or tris-pyridyl DTPA. Mono-pyridyl DTPA is apparently not sufficiently strongly bound on the electrode surface, while tris-pyridyl DTPA likely self-aggregates on the surface. In the future, we are going to see more studies on N-heterotriangulene derivatives as they show interesting properties. For instance, self-assembled compound with the heterotriangulene core enables long-range energy transport at room temperature and can potentially be used in building organic nanophotonic devices (see this Nature article). If you are interested more in chemistry and physics of these compounds, have a look at this review by Milan Kivala and his group. 1. Ute Meinhardt, Fabian Lodermeyer, Tobias A. Schaub, Andreas Kunzmann, Pavlo O. Dral, Anna Chiara Sale, Frank Hampel, Dirk M. Guldi, Ruben D. Costa, Milan Kivala, N-Heterotriangulene chromophores with 4-pyridyl anchors for dye-sensitized solar cells. RSC Adv. 2016, 6, 67372–67377. DOI: 10.1039/C6RA14799B. See also the references therein for some of the claims made in this post. 1 Pings/Trackbacks for "Pyridyl N-Heterotriangulenes for Photovoltaics"